Julius Caesar: Can you sing it? 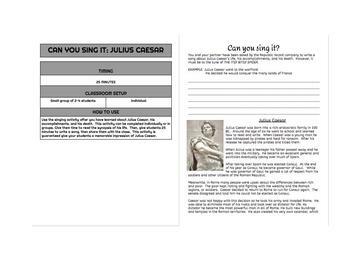 Use the singing activity to learn about Julius Caesar, his accomplishments, and his death. This activity can be completed individually or in groups. Activity comes with a short reading and signing activity. Students will create a song about Julius Caesar, then and share with the class. This activity is guaranteed give your students a memorable impression of Julius Caesar.